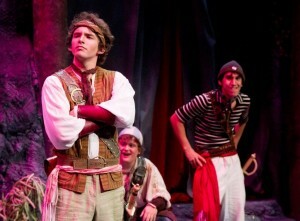 Trevor Roberts (left) stars as 'Frederic' in "The Pirates of Penzance." Last weekend, GCU’s first performance from the newly re-established College of Fine Arts and Production premiered on the Ethington Theatre stage — and people are taking notice. “The Pirates of Penzance,” a comic musical about a boy named Frederic who is apprenticed by a band of tenderhearted pirates, has received impressive reviews. Trevor Roberts, a nursing major at GCU, steals the show with his outstanding portrayal of the naïve Frederic. Roberts says the drama program was one of the things that originally drew him to GCU for his freshman year. He was disappointed when the University then dropped the program while undergoing a major restructuring. Three years later, he finally has been given the opportunity to act in front of an audience. 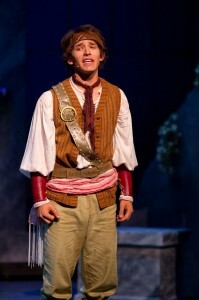 Acting is a passion for Roberts, who plans on participating in community theatre after he graduates from Grand Canyon. Roberts, who was surrounded by audience members offering congratulations after last Saturday night’s sold-out performance, encourages his fellow students to check out the play this coming weekend. The final three performances of “The Pirates of Penzance” are Friday and Saturday (7:30 p.m.) and Sunday (2 p.m.). To reserve tickets, call 639.8880. Tickets also are available at the door; bring a student ID to receive the $5 discount price. Brooke Bellah, a junior at GCU, is a reporter for the Communications staff this school year. She is majoring in English literature with a minor in communications. Contact her at herd@gcu.edu. Well I’m not surprised. Trevor Roberts comes from an extremely blessed, gifted & talented family! Way to go Trevor! Hey i was one of those people! I wish I could have seen it. Well done Trevor.